Transform an ordinary space with this industrial wire wall mirror from Noble Park. This square wall mirror is surrounded by a wrapped wire frame that adds texture and character to any wall. The brown finish is detailed with subtle copper flecks on top of a metal frame. 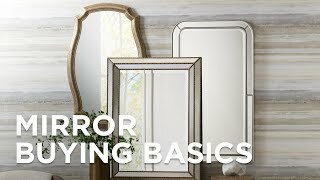 This standout mirror can be installed vertically only. 30 1/2" wide x 30 1/2" high x 1 1/2" deep. Hang weight is 17.16 lbs. Glass only section is 19" wide x 19" high. Surrounding frame is 5 3/4" wide. Industrial wire wall mirror from Noble Park. Brown finish with copper flecks. Metal frame. Beveled glass.